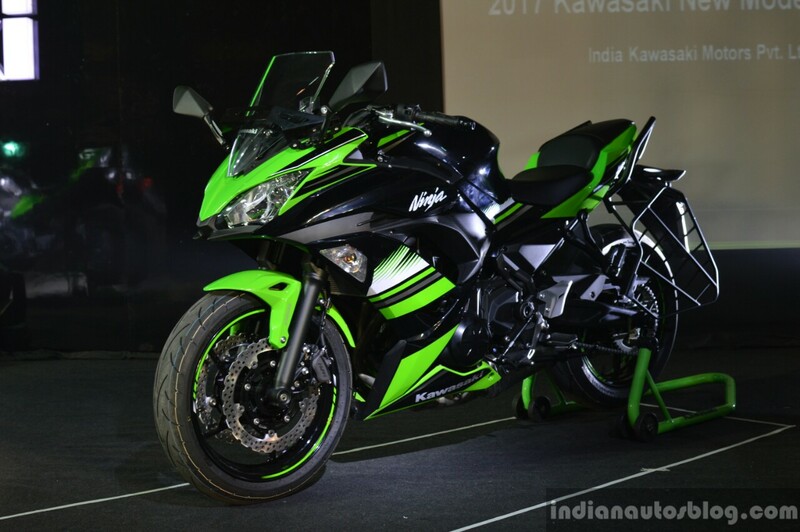 Kawasaki India is no longer associated with Bajaj and will sell all CKD and CBU bikes via exclusive dealerships. 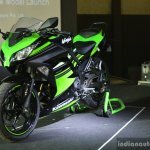 The 2017 Kawasaki Ninja 300 in India has the same power output. 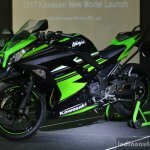 Kawasaki India has launched the 2017 Kawasaki Ninja 300 with mild cosmetic and mechanical changes. The bike, however, continues to be devoid of ABS which is offered internationally. The bike is powered by a twin cylinder 296 cc, liquid-cooled mill coupled to a 6-speed gearbox. The BSIV compliant engine is capable of producing 39 PS of maximum power at 11,000 rpm and 27 Nm of torque peaking at 10,000 rpm. The Kawasaki Ninja 300 continues to be suspended over 37 mm telescopic forks up front and a bottom link uni-trak monoshock in the rear with five step adjustable preload. Brakes include a 290 mm petal disc in the front and a 220 mm petal unit in the rear, both with dual piston callipers. 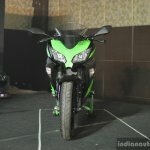 The Kawasaki Ninja 300 in India gets new colours and possibly the oddest grabrail seen in a modern day Kawasaki. The bike continues to get a slipper clutch. 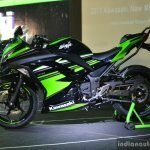 The 2017 Kawasaki Ninja 300 has been priced at INR 3.64 lakhs (ex-showroom, Delhi). The 2017 Kawasaki Ninja 650 produces 3 PS less power but is 18 kg lighter than the outgoing version. The 2017 Kawasaki Ninja 650 was first showcased at Intermot last year. The bike gets several mechanical and cosmetic changes and has emerged sharper than the outgoing version. The front cowl is new and while the tail section is shorter. Powering the bike is a 649 cc parallel twin mill coupled to a 6-speed gearbox. The engine is capable of producing 68 PS of maximum power at 8,000 rpm and 65.7 Nm of peak torque at 6,500 rpm. The 2017 Kawasaki Ninja 650 tips the scales at 193 kg and has lost 18 kg in comparison to the outgoing version. It gets a new steel trellis frame and adjustable wind deflector. The bike is suspended over telescopic forks up front and a horizontal back-link monoshock in the rear with adjustable preload. The instrumentation console is also new and gets an adjustable shift up light, gear position indicator and ambient temperature read out. The brakes are new and get Nissin calliper while ABS has now been made standard. 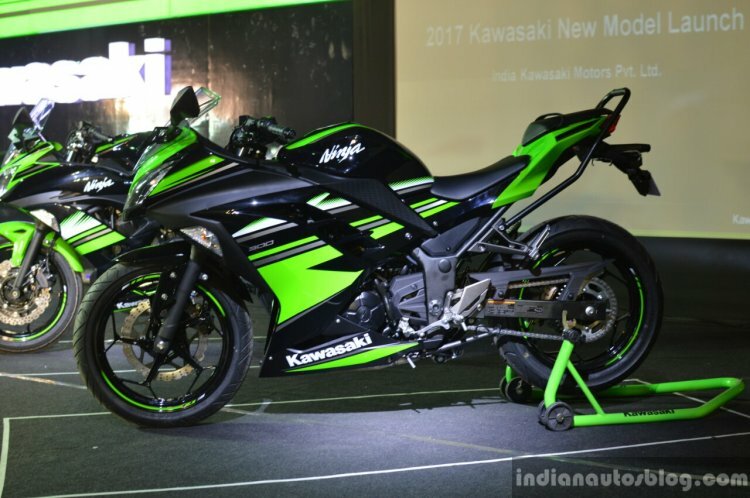 The 2017 Kawasaki Ninja 650 has been priced in India at INR 5.69 lakhs (ex-showroom Delhi).